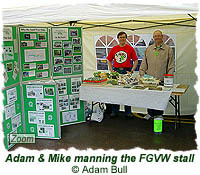 The FGVW had a stall at the Chapel Allerton Festival on Saturday 2nd September 2006, for the second year running. Unfortunately torrential rain all morning eventually brought proceedings to an early close. 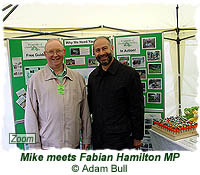 The event was cancelled, although a few brave stallholders (including ourselves!) 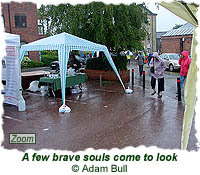 held out until about 1pm despite an ever-widening river in the car park where the stalls were pitched. 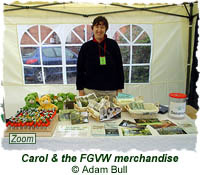 The FGVW stall promoted the group, sold merchandise (including Christmas cards, postcards, rulers, and photos), and provided general information about the woods, etc. 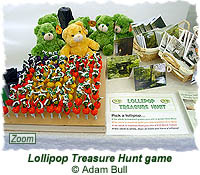 There was also the chance to win "eco-bears" on our new "Lollipop Treasure Hunt" game. 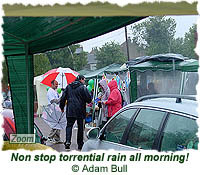 Due to the weather, takings only just covered the price of the stall and most visitors were other stallholders! Never mind... better luck next year!